Almost five decades ago, the toll of a bell and rolling thunder marked the conception of an ear splittingly monolithic riff. In that moment, BLACK SABBATH and the sound of heavy metal were forged. The band embarked on what vocalist Ozzy Osbourne describes as the most incredible adventure you could think of, a journey that would go on to define a genre. 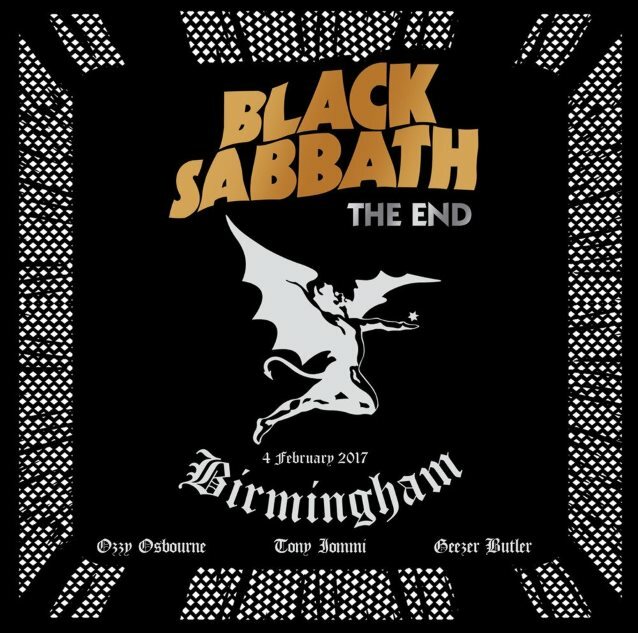 “The End” is a celebration of BLACK SABBATH‘s final hometown concert at Birmingham’s Genting Arena on February 4, 2017. This unforgettable farewell show from one of the biggest bands in the world will be released by Eagle Vision on November 17, 2017. With a hit-packed set list including “Iron Man”, “Paranoid”, “War Pigs” and many more, the high production values, visual effects, and pyrotechnics wowed fans, as the band delivered the most emotionally charged show in their history. All visual formats feature special bonus material of the band playing a selection of their favorite songs not played on tour. These intimate live sessions at Angelic Studios were recorded in the days after their final live performance. “The End” captures a once-in-a-career performance, an essential snapshot of musical history, and a fitting farewell to true innovators and original heavy metal icons, BLACK SABBATH. A performance clip of the song “War Pigs”, taken from “The End”, can be seen below. Pre-orders are available now via PledgeMusic, where exclusive bundles, such as the deluxe box set, can be found. The band decided to make this tour its last because Iommi, who was diagnosed with cancer in 2012 and is currently in remission, can no longer travel for extended amounts of time. The original lineup of SABBATH came together in 1969 with Osbourne, Iommi, Geezer Butler on bass and Bill Ward on drums. That lineup recorded and toured through 1978, and periodically reformed through the ’90s and 2000s for live work. They regrouped again in late 2011 for a new album and tour, although Ward dropped out after a few months over financial issues. SABBATH has used Ozzy‘s regular touring drummer Tommy Clufetos since then for live work. RAGE AGAINST THE MACHINE‘s Brad Wilk laid down the drum tracks on the album “13”, which came out in June 2013. Iommi and Butler haven’t announced any specific post-SABBATH plans yet, but Osbourne will embark on a two-year “farewell” tour in 2018, after already playing a few solo shows this summer.